Nerussa would like you to collect six bottles of a rare wine for her. Talk to Nerussa, innkeeper of Wawnet Inn in the village of Weye. Find the requested six bottles of Shadowbanish Wine. Return to Nerussa for your reward. Travel to the village of Weye, which lies just west of the main bridge into the Imperial City. Talk to Nerussa, proprietor of the Wawnet Inn in Weye. Nerussa is seeking some rare, fine wines and she will discuss what she's looking for if you talk to her about "Wine". 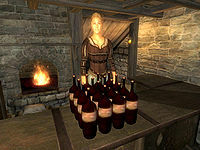 She will request that you collect six bottles of Shadowbanish Wine, which can be found in some of the old fort ruins around Cyrodiil, and offers to pay handsomely for them. I've come across a bottle of wine with markings I've never seen before. I can barely make out "Shadowbanish Wine" on the label. It must be quite valuable. I should hold onto it until I find out more. You will need to find Nerussa to learn more. Frostcrag Spire — A tower east of Bruma that serves as a home for magic-oriented characters (plugin-specific). (map) Contains one non-respawning bottle in the vault in a wine rack. Battlehorn Castle — A large castle west of Chorrol that can be won by defeating the attacking marauders (plugin-specific). (map) Contains one non-respawning bottle in the wine cellar. Return to the Wawnet Inn and give the six bottles of Shadowbanish Wine to Nerussa, who will promptly pay you 1,000 gold in return. She will also inform you that she will pay 100 gold for each additional bottle of Shadowbanish Wine you bring in. It is not possible to use the duplication glitch on the wine. You can sell Shadowbanish Wine to other merchants too (but of course for a lower price). It won't interrupt the quest, since you can retrieve more wine from the forts listed above. The wine is described as having been "made in one tiny batch", however an infinite amount is available since it respawns repeatedly. This issue has been addressed by the Unofficial Oblivion Patch; Only a limited supply of wine is available now. 10 I've come across a bottle of wine with markings I've never seen before. I can barely make out "Shadowbanish Wine" on the label. It must be quite valuable. I should hold onto it until I find out more. 20 I've spoken to Nerussa, the publican at the Wawnet Inn just outside the Imperial City. She's searching for a rare wine named Shadowbanish Wine that she says is most commonly found in fort ruins. She tells me if I retrieve six bottles, I'll be well compensated. Looks like I'll need to keep a careful eye out. 30 I've recovered six bottles of Shadowbanish Wine. I should bring them back to Nerussa at the Wawnet Inn for my final reward. 100 Finishes quest I've given six bottles of Shadowbanish Wine to Nerussa. In return, she paid me a large finder's fee of 1000 gold. She also told me if I find any more bottles of the wine, she'd gladly pay me 100 gold each for them. It is possible to use the console to advance through the quest by entering setstage SQ08 stage, where stage is the number of the stage you wish to complete. It is not possible to un-complete (i.e. go back) quest stages. See SetStage for more information. Esta página foi modificada pela última vez à(s) 19h54min de 19 de julho de 2014.